Marketing is a cornerstone of any successful business strategy. In B2B Marketing one of the most effective approaches to take is to use a case study as an example. A case study allows you to identify an issue, demonstrate how the issue was addressed, and highlight the end results. This works well in B2B Marketing because it shows your company’s services applied in meaningful way to fix an issue which in turn demonstrates a ROI to potential clients. Here are the key components of a good case study. A case study in B2B Marketing demonstrates to potential clients that you are able to fulfill a business need they have. Your marketing and public relations efforts shouldn’t be based on telling everyone how great your company is, but on the results you have helped other companies generate. By showing a prospect that you successfully used your expertise to solve an issue they were experiencing you create credibility and are seen as an expert in your field. The goal of B2B Marketing is to convince potential clients that you are the right team for them and give them a good reason to reach out to you for assistance. 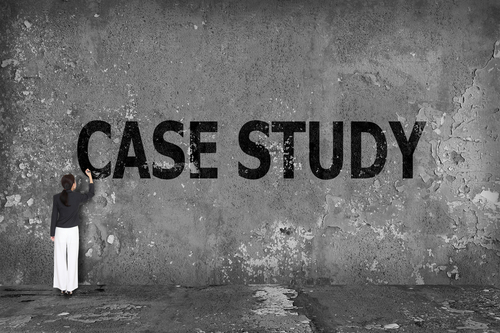 What Makes A Good B2B Marketing Case Study? Actual Results: your case study shouldn’t be generalized. It needs exact figures that have real world meaning. Potential clients are looking for real results to drive down costs, increase ROI, and increase efficiency in key areas. You need to display value that they can relate to and apply to their unique situations. A Good Word: while real world data is essential don’t overlook the value of a story from your clients. A client speaking about how you helped them and assisted in making their company a better place resonates with potential clients. There has to be a human element to what you do. Formatting: make sure your title is an exciting one, make good use of photography, don’t write overly long articles 800 to 1,500 words will do in most cases, list contact information for yourself and the case study client, and make the study easy to download so potential clients can read it on their own time. Outside Experts: if your company lacks the tools to do a successful case study don’t be afraid to hire outside experts with experience in developing this content. Also experts from outside of your industry can offer a unique viewpoint and perspective you may not have considered. Any good case study needs a subject. However, getting clients to participate can be a challenge. Many are concerned about their image or company secrets being exposed. Assure them that by being a case study subject they get their name out in the marketplace, their secrets will be protected, and they’ll get a chance to review the study before you even release it. For example Geneva National’s case study shows them as a sought after and respected company. We were able to turn lemons into lemonade for the client. B2B Marketing is by no means easy. But by making proper use of case studies as a marketing tool you can increase your company’s sales, reach new clients, and increase exposure in the marketplace. Consider using case studies at trade shows, in direct mail campaigns, linked to social media posts and of course, on your website. Leveraging content on multiple platforms is not only advisable, its also a smart way to keep your marketing budget in check while also reaching prospects that have varying media habits. As a bonus, keep in mind that case studies and white papers are often great ways to secure leads. Attaching them to a download option on your website is an easy way to identify new prospects and potentially warm leads. Winger Marketing is a full-service marketing and public relations agency headquartered in Chicago. For more than 30 years, we have successfully worked with middle-market clients, small businesses, non-profit organizations and fortune 10 companies to meet their business goals through inspired public relations and integrated marketing campaigns. Winger Marketing also works with other national and international PR Agencies as its Chicago branch or “boots-on-the-ground” firm. We leverage our experience in industries ranging from healthcare and law, real estate and travel, to cultural and educational institutions. Our custom solutions for businesses allow us to scale a marketing plan and PR campaign that is right for your company.